The department is dedicated to providing excellent patient care and outstanding education to students and residents. We are committed to provide the best available treatment for all conditions of musculoskeletal system from newborns to the elderly. All manners of trauma cases are managed with latest implants and techniques. Regular OPD’s are conducted daily from 8:00 AM – 3:00 PM including Sundays. We have 24X7 emergency services available, providing expert management at all times with Operation theatre facilities round the clock. Arthoplasties of hip, knee, shoulder and elbow are performed. Arthroscopy of hip, shoulder, knee, ankle including reconstruction of cruciate ligament, menisectomy etc are routinely performed and Rotator cuff repairs of the shoulder are also regularly done. Ilizarov technique have been used on many patients as needed. Platelet Rich Plasma preparations in various settings like non healing ulcers, epicondylitis, plantar fascitis etc were undertaken with good results. Paediatric orthopaedics services are provided for the entire spectrum of problems like CTEV, CHD, CP arthrogyposis, Vertical talus, Blounts disease etc. 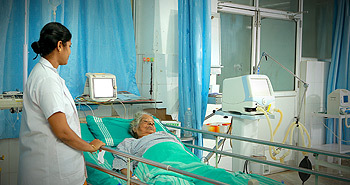 The department contributed to the conduct of peripheral and base hospital camps conducted round the year. Regular classes for MBBS students, post graduate MS Orthopaedics are conducted with seminars, ward rounds, journal presentations, case discussions and topic presentations. The M.S Post Graduate course was recognized in July 2016 by the MCI. Our first post graduate student passed in the exam conducted in July 2016. To achieve academic and clinical excellence so as to offer the best treatment to our patients, all our faculty regularly attend various CME programmes and training sessions all over the country and abroad. Advanced training in Arthroscopy was attended by Prof. Cherian and Dr. Mithun. The national conference IOACON 2016 was attended by majority of our faculty. DR. Roshan attended the national Rheumatology conference IRACON 2016. The state conference KOACON 2016 was also attended by most of our faculty. Dr. Midhun Krishnan was selected as Associate editor of the International Journal of Orthopaedics in Feb 2017. Poster presentations by Dr. Rithuraj at IOACON 2016 and Dr. Hany Hameed at KOACON 2017.